The steep rocks of the Lofoten archipelago behind the fishing boats and typical red and white houses in Henningsvær. 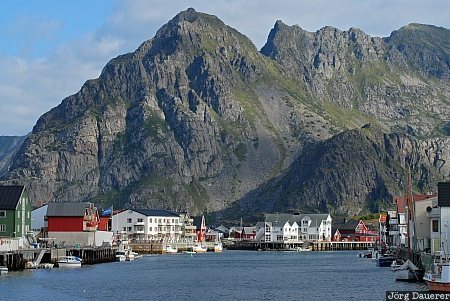 Henningsvær is on Austvågøy, an island of the Lofoten archipelago in Nordland, Norway. This photo was taken in the morning of a cloudy day in August of 2010. This photo was taken with a digital camera.